A butterfly at Melbourne Zoo Butterfly House. Butterflies are beautiful, flying insects with large scaly wings. Like all insects, they have six jointed legs, 3 body parts, a pair of antennae, compound eyes, and an exoskeleton. The three body parts are the head, thorax the chest, and abdomen the tail end. The butterfly`s body is covered by tiny sensory hairs. 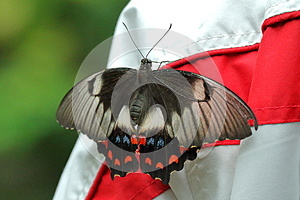 The four wings and the six legs of the butterfly are attached to the thorax. The thorax contains the muscles that make the legs and wings move. Egg - A butterfly starts its life as an egg, often laid on a leaf. Larva - The larva caterpillar hatches from an egg and eats leaves or flowers almost constantly. The caterpillar molts loses its old skin many times as it grows. The caterpillar will increase up to several thousand times in size before pupating. Pupa - It turns into a pupa chrysalis; this is a resting stage. Adult - A beautiful, flying adult emerges. This adult will continue the cycle.